THRIVE freeze-dried sweet corn brings the tastes of summer to your table anytime of the year! This golden, nutrient-rich vegetable is a great addition to any of your daily meals or snacks. 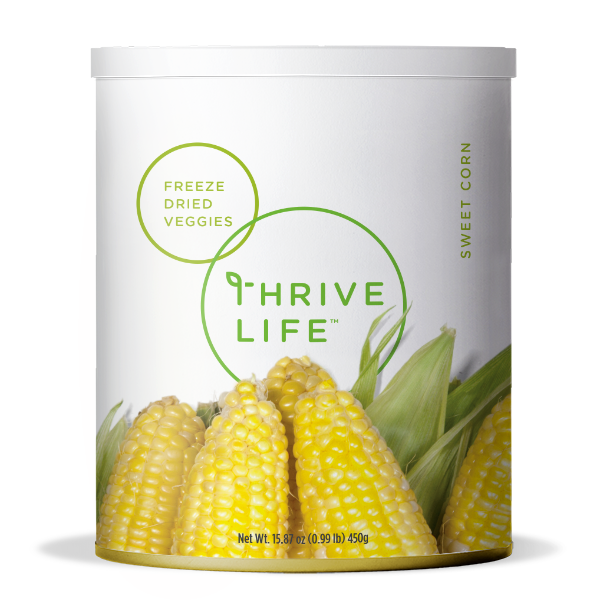 You will enjoy THRIVE Sweet Corn no matter how you use it. It will add a perfectly sweet flavor to any of your favorite salsas, dips, and soups. You can also try baking it into casserole and rice dishes. Or you might just want to eat it straight from the can! Add 1⁄3 cup of water to 1 cup Sweet Corn; let sit covered for 5-10 minutes or until tender. Make it as an easy, healthy side dish or add it to chowders, casseroles, and pot pies. It’s not hard like dried corn so it’s great for snacking. Fix it with pretzels or season and bake them for a crunchy treat!